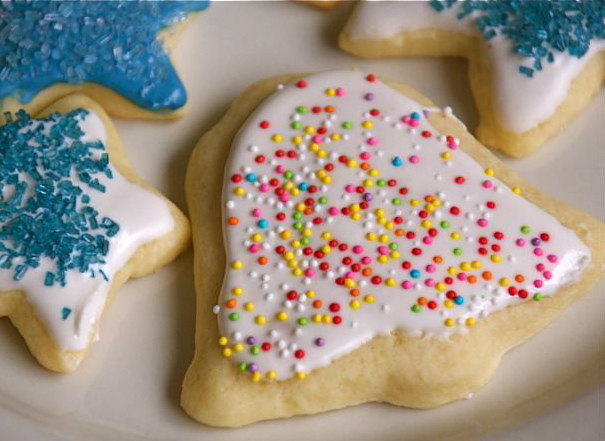 I hate sugar cookies — at least, those that taste like nothing, or like nothing but plain sugar and flour. That said, I understand the allure of cutting cookie dough into shapes, spreading the baked ones with icing, then shaking on the sparkles, jimmies, and dragées. It's a fun thing to do with kids (it's even fun without kids). When I found the recipe for Butter Cut-Out Cookies in Nigella Lawson's How to Be a Domestic Goddess, I stopped grimacing at the annual pressure to make cookie-cutter treats. These cookies are delicious, tasting of butter and vanilla; they're especially good topped with a lemony icing instead of the usual powdered-sugar-and-water paste (easy to make, but nasty to eat). Speaking of icing: If you'd like to decorate gingerbread cookies, try this Epicurious recipe. It's my all-time favorite. p(blue). With our Sweet 16 blog, we present a holiday dessert recipe every weekday for the first few weeks of December. Congratulations to [/user/lisalmg25 "Lisa"], who was our daily book winner for December 20.\ Check out our latest Sweet 16 blog recipe for your last chance to win.